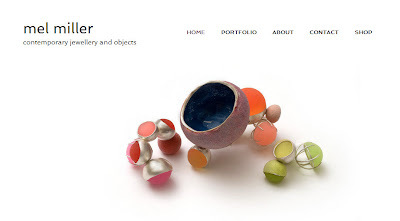 I've spent a fair bit of time recently working on my new website, and a big part of that was making sure my images had a truly white background, so that the object appears to float on the page rather than looking like a flat photograph. Part of that was a lot of professional photography, and part was standardising the white of my image backgrounds using GIMP, a free, open-source photo editing software similar to Photoshop. I feel I should start this post with a disclaimer: no amount of editing is going to take the place of really high quality professional photographs, and for some applications, like submitting your work for some books, you'll be asked not to edit images in any way unless you are a professional photographer. That said, it's likely that there will be circumstances where you need to or want to take photos of your work yourself, and that's where knowing how to successfully edit for white backgrounds comes in really handy. Open your file with GIMP. The entire image opens as the Background layer. 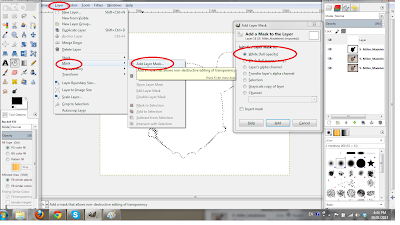 In the Layer menu, select Duplicate Layer to create a duplicate of the background layer. *This means your original image is always there, sitting in behind the changes you make. Working with duplicate layers preserves the integrity of your file, and also makes it possible to return to the original, if necessary. *You can click on the images below to see a larger version. They will open in a pop-up window on top of the main screen. Working on the duplicate layer, click Colors, then Levels. You'll see 3 eyedropper icons in the pop-up screen - black, grey and white. Click the white eyedropper. Then click on your image background, on an area that is supposed to be white. *You need to be working in the correct layer for your changes to take effect. Click Windows - Dockable Dialogs - Layers to open the Layer dialog box. 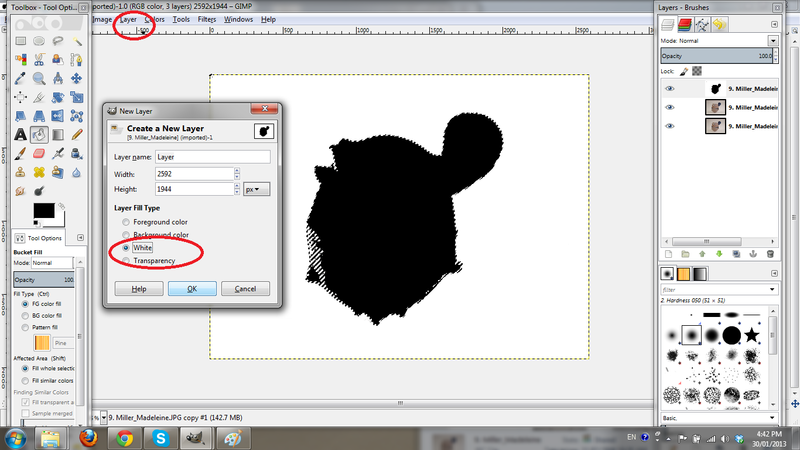 If you find yourself in the wrong layer, just click on the desired layer in the Layer dialog box. If the colours of your image alter when you click using the white eyedropper, click "Edit these settings as Curves" in the Levels dialog box. You can drag points on the colour curve to correct the colours. *This whole process works best if you have the best possible starting material. Make sure your photos are shot on a white background with the best possible lighting. Create a duplicate of this layer. Working on the new layer, choose the Fuzzy Select tool. Click to select the white background. This selection tool will select everything of a certain colour range, as long as it's touching the area you click on. So if your image is of a ring, you'll have to select the background inside the ring band separately. You can use Shift+click to add to the selection, or Ctrl+click to remove areas from the selection. If you find you're selecting too much or too little at once, change the Threshold. A Threshold around 15% works well. I recommend selecting the majority of the shadow areas as well. You can always paint these back in later, with more control. When you have all of the background selected, click on the Paint Bucket tool. Go to the colour select box and click to reverse the colours, so that your selected foreground colour is white. To make sure you're using the whitest white, you can click on the box and enter the colour code #ffffff. This is the code for the whitest white. 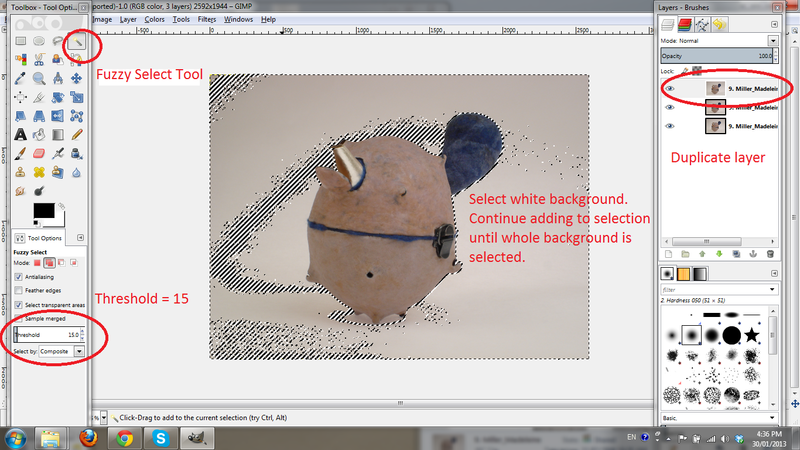 Before using the Paint Bucket tool, click Fill Whole Selection. 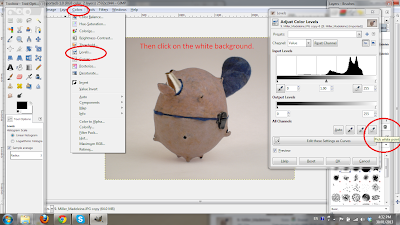 Now click anywhere in the white background to paint the whole area white. In the Select menu, choose Select Inverse. 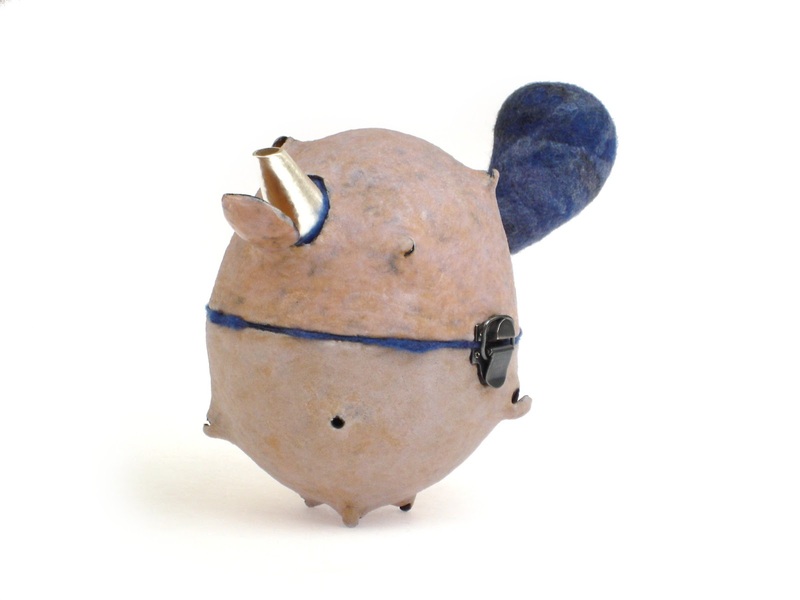 Now the foreground (the object) is selected. Go to the colour select box and click to reverse the colours again, so that your selected foreground colour is black. Click anywhere in the foreground to paint the whole area black. You've now created a template that you'll use for your Layer Mask. In the Select menu, choose Select All. In the Edit menu, choose Copy. In the Layers menu, choose Create New Layer. In the pop-up box that appears, select White background. In the Layers menu, go to Mask. 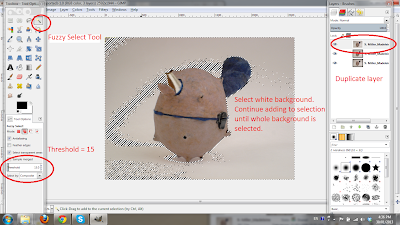 Select Create Layer Mask. The default layer mask has a white background. Click OK in the pop up box. Go to the Layers dialog box. See the layer below the current layer? That's the layer that you made your selections on to create a template for your Layer Mask. Click the eye next to that layer to hide it. Your image will reappear! At this stage, the edges might be a little ragged. Now it's time to refine the Layer Mask. Select the Paintbrush tool. In the Toolbox, choose a soft-edged brush. I like to use the brush with 25% softness. Now use the slider below to make the brush very large. A good size can be up to the size of the entire object. If your image is of something narrow like a chain, make your brush about the diameter of the chain. Use this brush to edit your Layer Mask. Remember your mask is covering the background. Whatever shows as black in your mask is transparent, and the white areas are masking what's below them. Paint with black to remove areas from the mask (and reveal more of the image). Paint with white to add areas to the mask (and conceal more of the image). 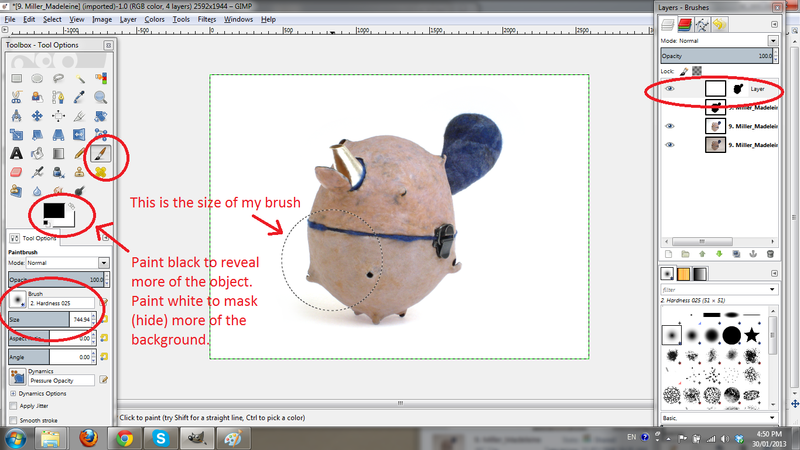 Here's where you can paint back in the shadows and blend them into the white background of the mask. Make sure you're working on the layer with the Layer Mask for this step. That's it! In the File menu, click Save to save your work. This will save your file as an .xcf file (the GIMP file extension). .xcf files support layers, so everything you've done is saved, including the layers, and you can edit it again if you choose. To save as a different file extension (e.g. jpg), go to the File menu and choose Export. Your file will be flattened into one layer as a jpg, so it's always a good idea to keep both an .xcf original file and an exported .jpg file. Got it? Now, let's speed that up: What we just went through seems like a lot of work, but it can go a whole lot faster using GIMP's built-in keyboard shortcuts. You can also assign dynamic keyboard shortcuts to whatever you want, but here's how to do all of the above using just the built-in shortcuts. Ready? ALT+C, then L: Open Layers dialog box. Click on the white eyedropper. Click on the white background. Click on the Eyedropper Select tool. Click on the white background until all of the background is selected (including inside rings, etc). Click to reverse the black and white colour boxes to select white. Click on the white background to paint white. Click to reverse the black and white colour boxes to select black. Click on the foreground to paint black. 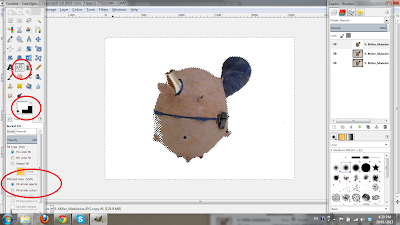 ALT+L, then M, then Y: Create Layer Mask. Click the eye symbol next to the previous layer in the Layer dialog box, to hide the layer. Paint your changes onto the mask. CTRL+S: Save as .xcf file. CTRL+SHIFT+E: Export as .jpg or other file extension. Fantastic Mel - thank you, will certainly look into this. Thank you for this tutorial! I'm trying this with the watercolour painting I did recently since I couldn't capture the white parts properly. I've spent too many hours trying to find a good explanation of this, and this is the first one that I was able to really understand. Thanks so much! Waw! Interesting post. To work will be help Keyboard shortcut. Its will be help to first work. Background Removal Service related Keyboard shortcut will be help on photoshop. Informative post really helpful but I like to work with Photoshop. Thanks. Or any other images or products Background removing. If your Order requirement is NOT listed above, just contact me before ordering. I will give you good solution. Please Knock me First before order. Its a really informative post..
Background Remove is my one of favorite things. I love Photoshop background remove service. I found very amazing photo edit service at PhotoEditExperts . I would be very happy if you check this incredible site. Wonderful Article on the necessity of white backgrounds in images. Really true white backgrounds make images fantastic and amazing. So, there is no alternative to Background Removal Service. Thanks for sharing the post. Waw! Interesting message. To work will be aid Key-board faster way. Its will certainly be assistance to first job. Background removal service relevant Key-board faster way will certainly be assistance on photoshop. GIMP is one of the best free photo editing software to edit photo. I am also using this helpful software and feel ease to remove the background from an image. Great. You have really done it very nicely.